As you may have noticed if you’ve read this blog for a while, I do not review patterns or pattern books. The reason for this is twofold. First, other bloggers and podcasters review many patterns and pattern books. Second, I don’t personally purchase many patterns or pattern books. The primary reason for that is my queue of projects to complete is always quite long. My experience is that I frequently change my mind about what I want to knit, so I prefer to purchase patterns immediately before I plan to make them, rather than when they are first released. By the time I buy patterns or pattern books, they’ve been well and thoroughly reviewed by many others. In order to find books to review on this blog, I look at upcoming publications on Amazon and purchase the ones that look interesting to me. I was excited when I saw The Big Book of Granny Squares: 365 Crochet Motifs show up in that list a few months ago, because I’ve been looking for a good crocheting stitch dictionary and this looked like it would fit the bill. I was not disappointed. The first 25 pages of the book are the kind of introductory material you expect in every book of this type: how to choose a hook and yarn (quantity, fiber choices, color choices) and an introduction to crocheting, including how to make all the basic stitches, a square, some decorative stitches, and how to join blocks together. 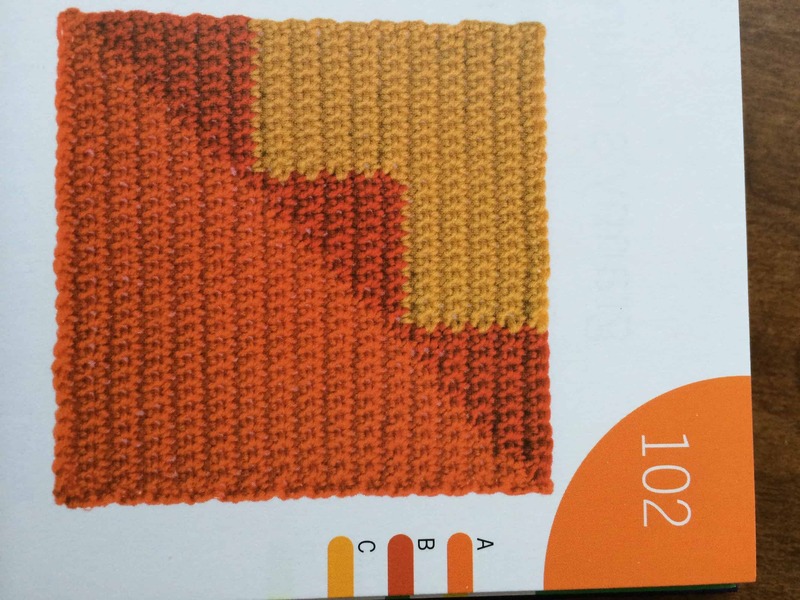 As a new crocheter, I appreciated this section of the book. I especially like the instructions for basic stitches and decorative stitches. The explanations are clear, as are the illustrations accompanying each stitch. I think these are the clearest written directions for making basic stitches that I’ve seen and I am sure I will refer to them frequently until I finally memorize all the basic stitches! The patterns start on page 26 and run for 260 pages. Most pages have two squares to the page, but more complicated patterns with longer directions get a page to themselves. It is difficult to describe the full range of the patterns in the book. There’s the classic granny square of course, and multiple variations on the classic granny square. There’s lacy pieces, flower-inspired squares, pieces that play with placement of color in a manner that reminds me of modern art, squares that remind me of classic quilt blocks. With 365 options, there is probably something for everyone tucked into this book. Each pattern is rated for difficulty, with one star indicating the easiest blocks and four stars for the most challenging squares. I have one issue with this book and that is its organization. Lord chose to arrange the book according to the colors used in each block. The upper corner of each page is a solid color to indicate the color family. Along the edge of the page is a small color swatch for each color used in that block. 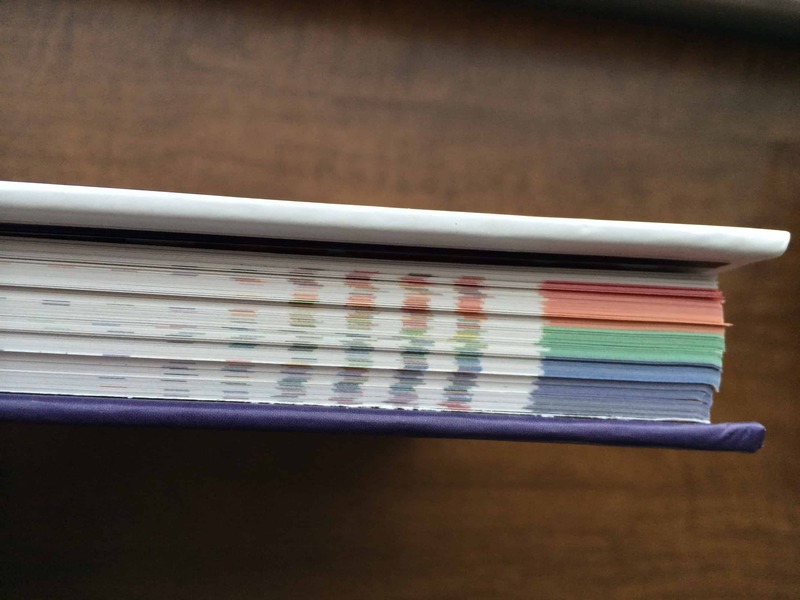 When the book is closed and you look at the edge of the pages, you get a sense of the full color range of the blocks in the book. This strikes me as an odd choice for arranging patterns in a book of this type. Do most people really plan to make the exact block, down to the color presented in a book? Or do they pick out the colors they like or have in their stash or even use up scraps leftover from other projects? If you want to organize a book according to color, you should provide alternative methods of accessing the book as well. The Big Book of Granny Squares does provide one index: alphabetical by the name of the block. However, it does not provide an index that is useful for someone like me, who plans to use this book as a way of learning crochet stitches. There is no index of patterns based on star ratings and the alphabetical index does not list the star rating of the pattern next to the name. The patterns are not organized from easiest to difficult within the color sections. Everything is all jumbled up willy-nilly (the classic granny square is on page 283, two pages from the end of the pattern section). In order to use the book in the way I want, I either have to go through a page at a time, crocheting a one star pattern when I find it, or I have to go through the entire book, make a list of the one star patterns, and decide on an order to crochet them. I’m probably going to go with the second of those options, and if I do, I will publish a list of the pattern names in the order I plan to crochet them. Despite this one major flaw, I do think this book will be useful for me. The pages are 8″ x 11″, the book uses a 12-point font, and it is spiral bound so it lays flat. These features make the book easy to read while crafting. I believe the wide range of squares will help build my crochet skills in the manner that I hoped. Overall, I am happy to add this to my fiber library.